These are pathologic “plateaus” of intracranial pressure. They are associated with vasodilation, the normal physiologic response to maintain cerebral perfusion pressure in the face of already increased intractanial pressure. Lundberg “B” waves are small, quick fluctuations in intracranial pressure indicative on unstable intracranial pressure and, in some studies, associated with cerebral vasospasm. 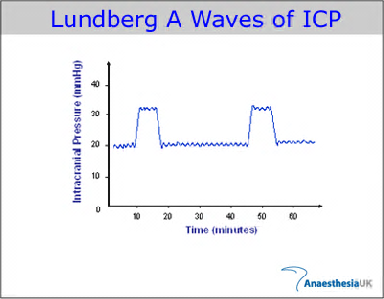 Lundberg “C” waves are oscillations with a frequency of 4-8 waves/min in the intracranial pressure curve. They are physiologic and associated with the respiratory cycle. Lundberg A waves are always pathological.Associated with rapid rise of ICP. Lundberg C waves are also associated with the Cardiac cycle along with the other physilogical phenomena.